The original Italian Lantaurion. Compare this with the Greek version, named Orion. One of the immediate differences is the box size. 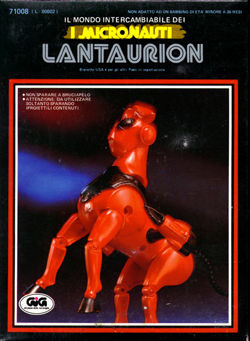 This version uses the standard box that was used for all the steeds by Mego and Gig (with the exception of Megas). Another difference is that this Lantaurion has the small, black hard-tipped missiles we love so much! The Greek version has the soft-tipped missiles. The box art below sports nifty hallucinogenic lighting backgrounds as well.